This monitoring and control solution lets you visualize the operating status of displays and projectors in detail, detecting symptoms of problems in real-time, and preventing malfunctions in advance. While reducing the burden for control and maintenance, it supports stable operation. In situations where it is essential that images are displayed without interruption and degradation does not occur, this system detects signs of trouble, and informs you to avoid serious problems. Up to 2048 displays and projectors on an intranet can be easily monitored and controlled from a single PC via a LAN network. And since you can also register other-brand equipment that is PJLink™ compatible, you can efficiently achieve centralized control over the entire system. 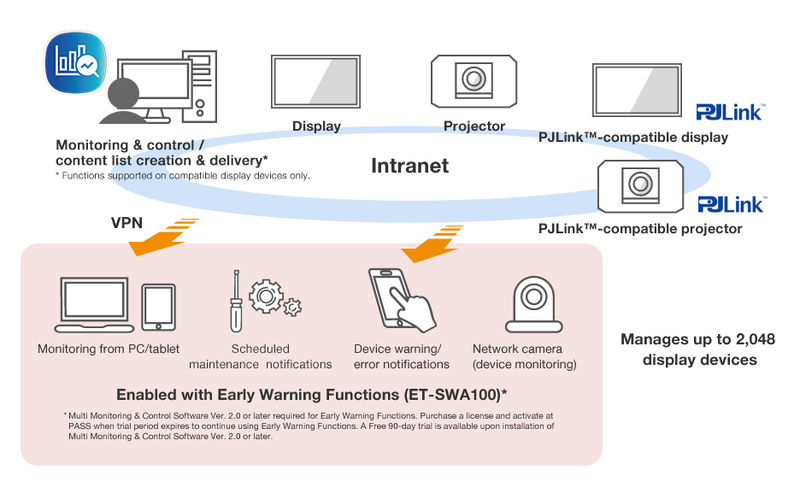 Also, by purchasing Early Warning Functions, you can remotely control and monitor the system with a web browser on a notebook PC or tablet device. Multi Monitoring & Control Software There is 1 product.